The Sony A3000 is an entry-level compact system camera that's styled to look and feel like a more traditional DSLR. Compatible with the manufacturer's range of E-mount lenses, the A3000 features a 20.1 megapixel Exmor APS HD CMOS sensor, 201,600-dot electronic viewfinder with 100% field coverage, 3-inch LCD screen, ISO range of 100-16000, Full HD video recording with a choice of 60/50i or 25p shooting modes and stereo sound, built-in pop-up flash, and a Multi Interface Shoe that allows you to attach various accessories such as a more powerful system flash, a video IR light or an external microphone. 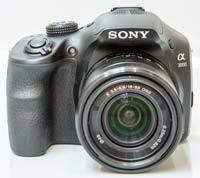 The Sony A3000 is priced at £370 / $400 including the 18-55mm f/3.5-5.6 OSS kit lens. At first glance the Sony A3000 looks like a DSLR or SLT camera, with a chunky handgrip and interchangeable lens at the front, external hotshoe on top, and an LCD screen and viewfinder on the rear. Technically, however, it's actually a compact system camera that uses Sony's range of E-mount lenses, the same lens mount that the extensive NEX line-up is based upon, and it doesn't have the mechanical mirror found inside a DSLR or the translucent mirror in Sony's Alpha range of SLT cameras. 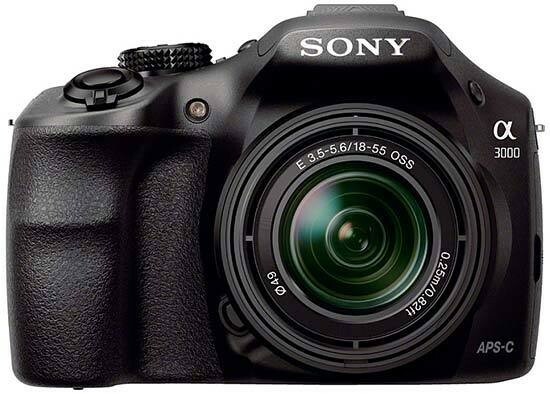 With many upgraders from compact cameras opting for a DSLR-like model, especially in the USA, the Sony A3000 has clearly been designed to appeal to people who don't know what a mirrorless camera is, while actually offering some of the benefits of that system. It's also very keenly priced, at £370 / $400 sitting alongside the NEX-3N at the bottom of Sony's interchangeable lens camera range. Measuring 128.0mm x 90.9mm x 84.5mm and weighing 411 grams, the Sony A3000 is very similar in size and weight to the now discontinued SLT-A37 camera. Although it feels a little plastic-y in hand, the A3000 is solid enough given its budget price-tag, feeling more like a super-zoom compact than a DSLR. Ultimately it's neither cheap enough to put you off from buying it, or solid enough to contend with more expensive models. The 18-55mm f/3.5-5.6 OSS kit lens actually feels a little small when mounted on the A3000, but it doesn help to keep the overall weight down, and usefully features built-in optical stabilisation. 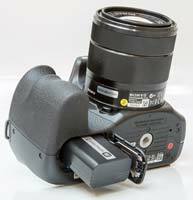 Compatibility with an existing Alpha A-mount DSLR lens proper is also offered via the optional LA-EA2 accessory adapter. Sony branding and DSLR-style lens release button aside, all we find on the A3000's faceplate is a small porthole-shaped window for the AF assist/self timer lamp, a button for releasing the pop-up flash, a large and comfortable handgrip with a textured surface for a firmer hold, plus the shutter release and On/Off buttons on the forward-sloping edge at its top. 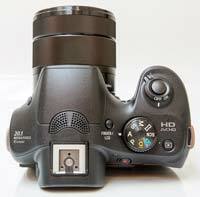 The A3000 is turned on or off via a flick of a chunky, nicely rigid switch which surrounds the shutter release. As this is an entry-level camera, there are no control wheels to change key values like aperture, shutter speed, exposure compensation and menu options, just a circular dial on the rear. Also located on the A30000's top-plate are a left and right (stereo in combination) microphone, the Multi Interface Shoe, a button for switching between the electronic viewfinder and LCD screen, a traditional shooting mode dial with a kurled edge and positive click, and a playback button. The shottoing mode dial includes standard P,A,S,M, 9-strong scene mode, Intelligent Auto and Superior Auto, plus the now standard Sweep Panorama mode. Press the shutter release button down halfway and, after the very briefest of pauses the AF point/s are highlighted in green accompanied by an optional beep of affirmation to indicate that the user is good to continue on and take the shot. The 25-point contrast-detection AF system isn't as speedy as the Fast Hybrid AF used by the NEX-5T, but it's certainly quick enough to keep up with the action. The A3000 has a satisfyingly brief and fairly quiet shutter click, and a full resolution JPEG is written to memory in about 2 seconds. There is the option to also shoot Raw files, or even more usefully for those who wish to hedge their bets, Raw and JPEG images in tandem. These settings are accessed within the Image Size folder and are found within the Quality sub folder. You also get Fine or Normal compression levels offered for JPEGs. Not everything on the A3000 is located exactly where you might expect it to be found. For example ISO settings are discovered within a Brightness menu option that from the look of the icon that denotes it initially appears to be for adjusting screen brightness only. One would reasonably expect ISO adjustment to be found within the Camera folder with the other key shooting options. And so there's a fair amount of familiarisation with the A3000's quirks required up front. The A3000's backplate is a pared-down affair, the majority of it taken up by the 3-inch widescreen ratio LCD screen. This is one of the areas where Sony have cut costs, with the low resolution of 230,400 dots resulting in a rather coarse display. Similarly, the electronic viewfinder is both small (0.5cm) and low in resolution (201,600 dots), although it does at least offer 100% scene coverage, something that a no comparably priced DSLR offers. There's also diopter control for glasses wearers, although what appears at first glance to be a rubber pad around the EVF is actually made of hard plastic. Switching between the EVF and the LCD can only be achieved by pressing the Finder/LCD button - there's no eye-sensor to automatically switch between the two, which slows down the operation of the camera and discourages you from using the EVF at all. Located above the LCD screen is the one-touch movie record button. Press this and the user is instantly recording video, whatever alternative shooting mode might previously have been in use, which proves essential with regard to spur of the moment filming. To the right of the screen is a textured thumb-grip, underneath which sits a trio of controls - the top and bottom buttons unmarked until the screen is activated, at which point their purpose is detailed alongside it. The top-most control is revealed as the 'menu' button, a press of which brings up the shooting icons - five in total - the contents of we've already briefly touched on. Instead of the screen-full of text you might expect to be presented with upon press of the menu control, from top left to bottom right of screen, presented instead are Camera, Image Size, Brightness/Colour, Playback, and Setup icons. The user moves through these options and makes selections via the scroll wheel just below the menu button, which has its own central (and again unmarked) set button. This wheel is quite responsive to the touch, which, on a positive note, means that tabbing through options is a swift process, but on the other hand it's easy to slip past the setting you actually wanted when hurrying through them as a photo opportunity suddenly presents itself. Set at four points around this scroll wheel/pad are a means of adjusting the display, ISO speed, exposure compensation (+/- 2EV selectable) and focus point, and drive mode (single shot, continuous, continuous with speed priority, so focus/exposure fixed from the first shot) and the self timer option (2 or 10 seconds) and a bracketing control for exposure. Disappointingly you have to delve into the Camera main menu system to access the various flash modes. The flash options more unusually include rear sync as well as slow sync, plus the regulars of auto and fill in. Somewhat confusingly the A3000's red eye reduction setting isn't also found here - instead it has to be first enabled via the aforementioned Setup folder if you're shooting portraits with flash. The bottom button on the camera back provides a means of calling up the on-screen shooting tips, via which Sony no doubt hopes to provide a crutch for new users trading up from a bog standard point and shoot compact. Examples of textual advice, complete with small pictorial thumbnail alongside, include 'increase the ISO sensitivity to make the shutter speed faster', and then, the thoughtful addition: 'higher ISO sensitivity may make noise stand out.' Hand-holding for those who want it then, while others may feel Sony has wasted one of its very few dedicated buttons on a feature that, like the manual, many will choose to ignore. At the base of the camera we commendably find a metal screw thread for a tripod directly beneath the lens mount, and, in the nether regions of the grip, a compartment storing the rechargeable battery, good for around 450 images. While the right hand side of the A3000 - if viewing it from the back - features a continuation of the ridged grip but is otherwise devoid of ports or controls, the left hand flank is where users will find a large covered port for the Multi Interface port and a slot for the memory card - here Sony reaching out to a wider audience by offering SD/SDHC/SDXC compatibility alongside its own Memory Stick. Large metal eyelets on either side of the camera for the supplied strap complete the A3000's design.